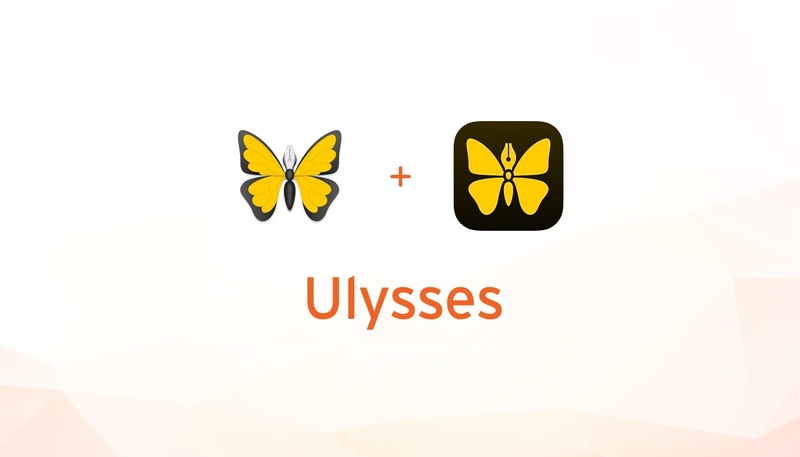 Users can try Ulysses for free for 14 days before deciding whether to subscribe. After 14 days, Ulysses works in a read-only mode, but documents can still be exported. Subscribing unlocks both the iOS and macOS versions of Ulysses. Students can subscribe for $10.99 for six-month periods. Existing users can take advantage of a limited-time lifetime discount equal to 50% off the monthly subscription price. 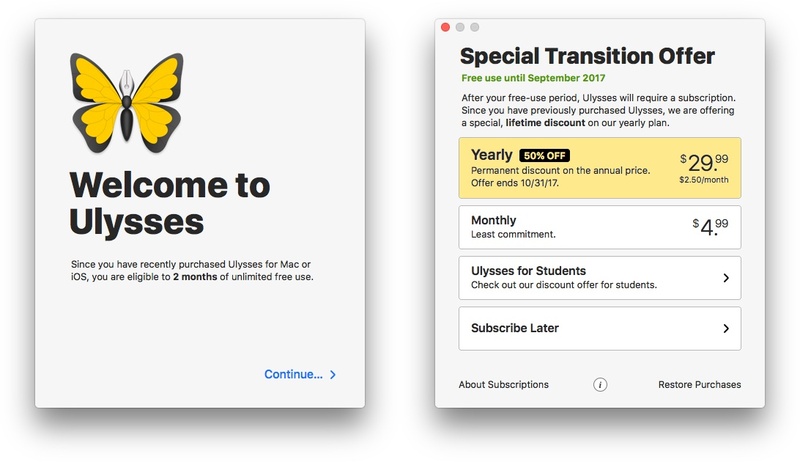 Users who recently purchased Ulysses on macOS will be given a free-use period of up to 12 months depending on when they purchased the app. Users who bought Ulysses on iOS can receive up to an additional 6 months of free use. Existing versions of Ulysses for iOS and macOS have been removed from the App Store and Mac App Store, but have been updated for iOS 11 and High Sierra, so they will continue to work for now if you decide to not subscribe. However, new features will be limited to the new versions of Ulysses that were released on the app stores today. I downloaded both versions and was impressed by the seamless transition, which explained the move to subscription pricing, the limited-time discount offer, and automatically gave me two free months of use even though I bought the apps nearly two years ago. My personalized onboarding for the macOS version of Ulysses. In addition to the announcement on the Ulysses blog, Max Seelemann, one of Ulysses’ founders, wrote a post on Medium explaining the company’s thinking behind moving to a subscription model that is worth reading. It’s a backstory that has become familiar. Pay-once pricing is not sufficient to sustain ongoing development of professional productivity apps like Ulysses. While Ulysses has enjoyed success, funding the kind of development that pro users expect through growing the app’s user base is not sustainable in the long-term. As Seelemann explains, several options were considered over a long period, but ultimately it’s subscription pricing that gives Ulysses the security and flexibility needed to maintain the app. I’m glad to see Ulysses adopt subscription pricing. I can’t say that would be the case for every app I use, but I use Ulysses every day. I want it to be actively developed and available for a long time. The tricky part about subscriptions, as we’ve discussed in the past on AppStories, is that the value proposition for each person is different. One person’s mission-critical app might be another’s nice-to-have app and the success of a subscription model depends on picking price points that appeal to a sustainable segment of users. However, the flexibility that Ulysses has adopted with different monthly, yearly, and student pricing tiers in comparison to its pre-subscription pricing strikes me as an approach that is well-positioned to succeed. Ulysses is available as a free download with a 14-day free trial on the App Store and the Mac App Store.